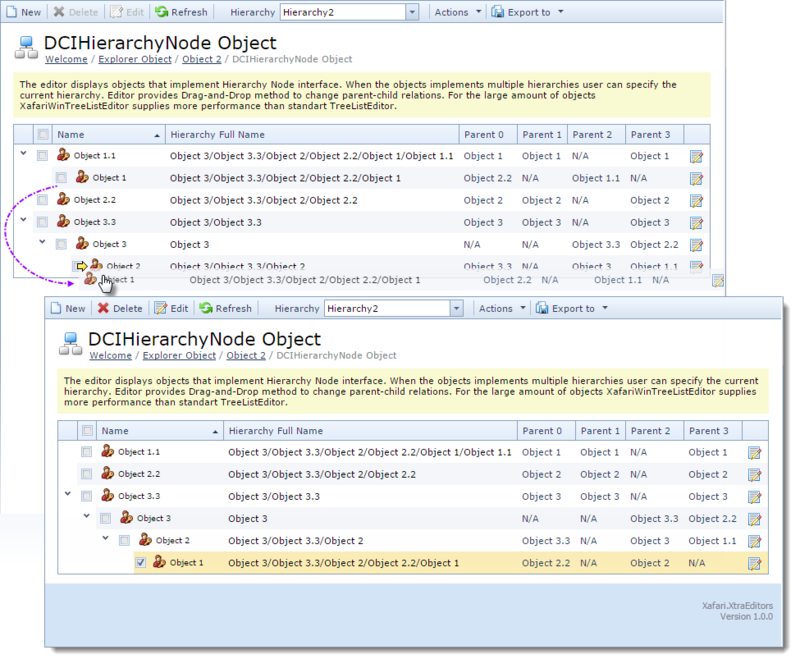 Similar to the Explorer List Editor, Hierarchy Node List Editore is intended to work with data that implement the IHierarchyNode interface, thus, it provides features of this interface. Hierarchy Node List Editor displays hierarchical objects as a tree-like structure, it allows the user to change the subordination using Drag-and-Drop functionality at runtime. 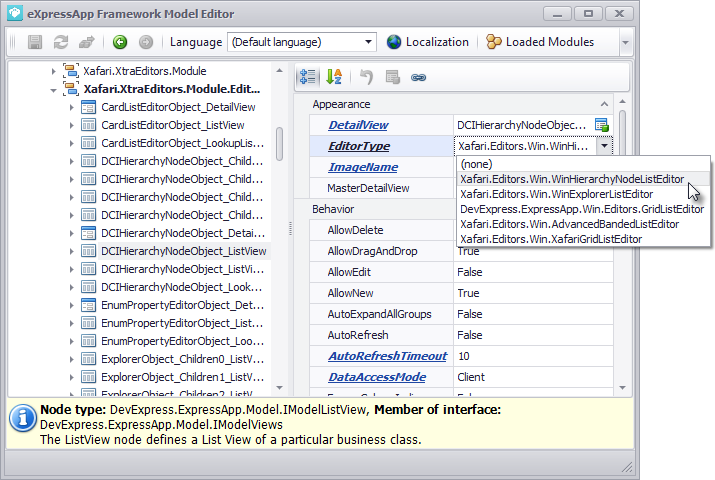 To use this List Editor it is required to implement IHierarchyNode interface. Refer to the special documentation or see the implementation in the Xafari.XtraEditors.Module | Editors| DCIHierarchyNodeObject.cs and HierarchyNodeDC.cs files of the Xafari XtraEditors demo installed with product. Once the hierarchy is implemented, invoke Model Editor and focus the corresponding Views|…_ListView node, set PropertyEditorType property to the WinHierarchyNodeListEditor (or ASPxHierarchyNodeListEditor) value. Run a Windows Forms or ASP.NET application and invoke corresponding Detail View. The user interaction with multiple hierarchies is organized similarly, as in the case of the Explorer List Editor. Both in Windows Forms and ASP.Net applications, the user can visually edit the hierarchical tree. It is enough to drag item and drop it to the required node using a mouse.